In the past ten years or so, the security landscape has grown and changed tremendously. As such, there is an increased demand in all sectors for security professionals who can face up to a corporate boardroom. The need for certified protection professionals is inevitable in today’s digital world. Organizations today are highly dependent on the credentials of the security professionals they hire as regular employees, partners, or consultants. Unfortunately, the security managers hired by most companies lack the necessary knowledge and skills pertaining to corporate asset protection. Furthermore, complex security and protection issues are challenges that can prove detrimental to the well-being of many people and to the tangible assets of large organizations, private corporations, and even government agencies. Recognizing this, the American Society for Industrial Security (ASIS) administers the Certified Protection Professional (CPP) program worldwide which provides skilled professionals in the field of asset protection. Following is a brief introduction to ASIS and a detailed account of the Certified Protection Professional (CPP) certificate and how to obtain it. The world’s largest organization for security professionals, the American Society for Industrial Security (ASIS), has over 38,000 members, and it is a representative of security professionals at the highest forums. Founded in 1951, ASIS builds a community of security professionals who take on the responsibility of protecting an organization’s assets which includes people, property, and/or information. The members of ASIS represent organizations of all sizes and virtually every industry in the public and private sectors. As a global community, ASIS represents a diverse group of professional from entry-level managers to security veterans to consultants to CSOs and CEOs. The most sought after of these certifications is the Certified Protection Professional (CPP). However, this certification is offered only to senior security professionals having 7 years or more of relevant work experience. For those without the required 7 years’ work experience, the Associate Protection Professional (APP) certification is a good option. Those who meet the eligibility criteria for CPP would want to know more about certification. We are going provide them with the details. 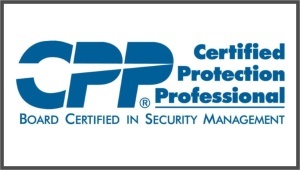 What Is Certified Protection Professional (CPP)? A certification being pursued by security professionals worldwide is the Certified Protection Professional (CPP). Administered by ASIS, CPP proves the knowledge and management skills of a person in all areas of security management. ASIS claims the certification to be the gold standard for security management professionals. Compared to non-CPP certified professionals, security professionals with CPP having a greater chance of being hired or getting promoted. CPP requires disciplined study—either on self-learning basis, via a study class or through an online group—and some relevant experience. However, the most important thing is to be committed to the process. To be eligible for induction into the CPP program, you need to have 9 years of security experience, with 3 years spent in charge of a security function. There is a relaxation of two years for those with a bachelor’s degree. Graduates from an accredited institution of higher education can enroll into the CPP program if they have 7 years of security experience, of which at least 3 years should be spent managing a security function. In addition to the educational requirements, prospective applicants need to be employed full-time in a security role and not have any history of criminal offence. They must also sign and agree to follow the ASIS Certification Code of Conduct and the policies of the ASIS Certification Programs as outlined in the Certification Handbook. Why Earn the Designation of CPP? As the pinnacle of achievement in the private security field, CPP requires candidates to meet extremely high standards and pre-requisites such as several years of experience in the security field including a few years in a management role. Moreover, they must pass an incredibly tough certification test that assesses their knowledge of all aspects of physical, intellectual, and personnel security. Professionals who pass the examination must prove their competency in physical, intellectual and personnel security, making them proven leaders in their professions and highly sought-after security professionals. This makes CPP a coveted designation or certification. CPP is administered by ASIS, the most respected organization in the security industry, which further enhances the appeal of earning the designation of CPP. No matter what course of employment they take in the future, CPP is a designation which will always add respect and prestige to the careers of the security professionals who obtain it. How to Get CPP Certified? The eligibility criteria for CPP is already detailed above. The other requirements for getting CPP certified is taking and passing a four-hour long examination. The examination comprises of 225 questions which include 200 MCQs and 25 randomly distributed pre-test (unscored) questions. The exam tests the skills and knowledge of professionals in seven key domains which are mentioned above. The certification fee for ASIS members is $300 and $450 for non-members. $200 is the fee to attempt the paper for a second time. While CPP is a highly coveted designation in the security industry, it can be obtained only by security professionals with several years of relevant experience. On the other hand, however, CPP is a credential that proves the ability of qualified senior staff members to do their jobs efficiently and to the highest professional standards.